Fill your vocabulary with "F" adjectives as you hone descriptive writing skills. Dress up the sentences in this worksheet and transform your writing from plain to fancy! "V" adjectives are vital for valuable writing. Your little learn will practise identifying adjectives and filling in the blanks with this grammar worksheet. Descriptive language adds interest to writing. Your little cowpoke can practise adding adjectives to a paragraph. When it's time for writing, the "W" adjectives are the way to go! Your wee writer will be a winner after completing these wonderful exercises. 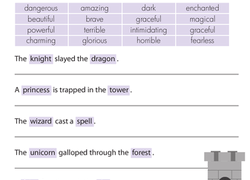 Your young learner can begin to build better writing skills with this worksheet on "B" adjectives. She'll get great practise with an important part of speech. With this colorful worksheet your third grader will practise her writing skills using alliteration. He'll have fun learning all about alliteration by writing a story with words that start with the letter B.